My mother came into town for a week to celebrate two holidays: Labor Day and Rosh Hashanah. First came Labor Day where we had a Labor Day cookout on Sunday followed by a day-long hike at Sugarloaf. The hike was wonderful and the cookout was a major hit. There were plenty of drinks and some additions to the food brought by guests! The food was great. The next couple posts will include recipes from the highlights. Passover has been wonderful so far. The greatest accomplishment of the Seder was the homemade gefilte fish. My mother and I had a lot of fun preparing this recipe. We also learned a lot in the process. 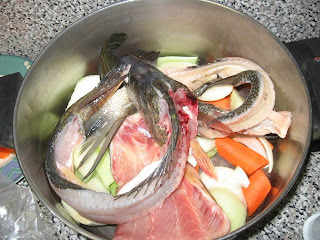 We were worried if the fish would smell bad (it did not), if we would have to deal with fish heads (we did! ), and how difficult the process would be. It took under 45 minutes of active preparation. Mothers, aunts, and grandmothers preparing gifiltefish for days is part of Jewish legends. I’ve heard stories about ladies who kept the fish in the bathtub to make sure that it was fresh! With the help of a fish counter and food processor, ours did not take the same amount of time– but it was fantastic. Try it yourself and serve with horseradish. Don’t be scared, it was fun. I will definitely be doing it again next year. 1. 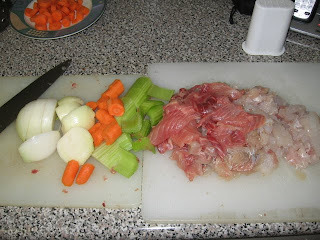 Start with making the fish stock by covering the fish bones, carrots, celery, and onions with water. 2. Add about 1/3 cup sugar and 3 teaspoons salt into the water. 3. Bring to a boil and then simmer while you prepare the remainder of the gefilte fish. 4. Ground the fish if it is not ground. The fish counter prepared the fish (we actually had a pound of each fish) but they would not grind it for us. Also, I had to take off some of the remaining skin. 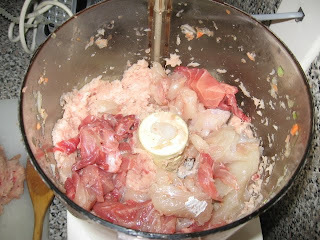 I then cut the fish up and used the food processor to grind the fish. Recipes call for adding water during this process to make sure that the fish remains the right consistency- I didn’t need to. 5. 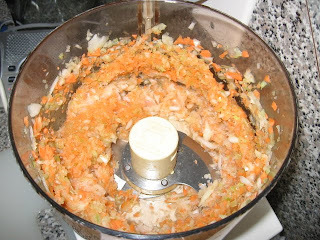 Mince the carrots, onion, and celery. 6. Mix together the ground fish and vegetables. 7. Add the eggs, matzoh meal, salt, pepper, sugar (don’t be scared, use it all!). 8. Chill, for easier handling, then shape into balls, using wet hands (re-dip as necessary) to form balls. 9. 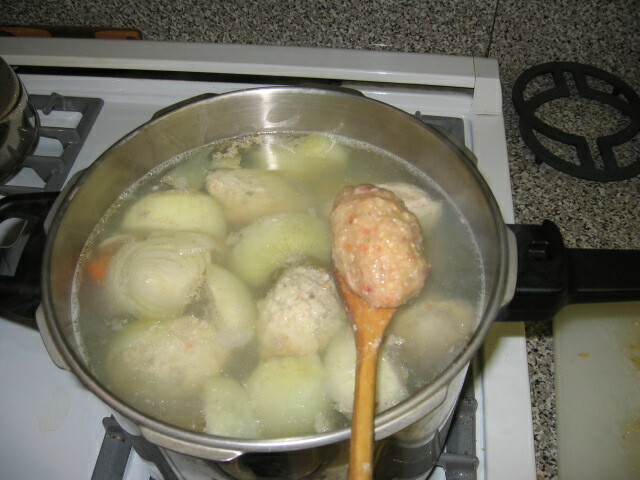 Add fish balls to the fish stock (with all the goods in the stock– including the fish bones and heads!) and simmer covered for 2 hours. 11. 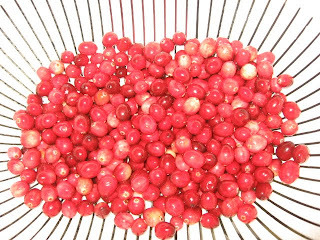 Enjoy with boiled carrots and horseradish. 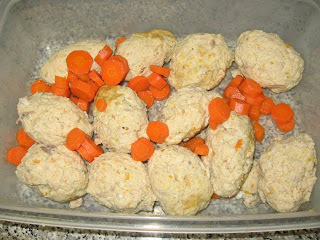 This is me looking “smug” (as my mother said) with a great sense of accomplishment– homemade gefilte fish! Although I’m cutting meat out of my daily life, I decided that I do not want to extend that practice to holiday celebrations. There is something very special about brisket on Passover. I am not ready to let go of that tradition (at least not yet). Here is the recipe my mother and I will be using this year for our Passover Seder on the first night. 1. Put a rack in middle of oven and preheat oven to 325. 2. Pat brisket dry and rub salt and pepper all over it. 3. Heat oil in 12 inch heavy skillet over moderately high heat until hot but not smoking. 4. Add brisket and cook, turning once, until browned on both sides, about 10 minutes. 5. Transfer brisket to a 13-by-9 inch baking dish. 6. Add onion to skillet and cook over moderate heat, stirring frequently, until browned 7 to 8 minutes. 7. 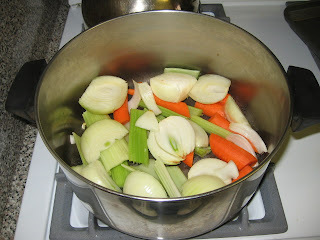 Add stock and deglaze skillet by boiling, scraping up browned bits for 1 minute. 8. Stir in remaining ingredients and bring to a simmer, stirring occasionally. 9. Pour sauce over brisket. 10. Cover meat with a sheet of parchment and cover pan tightly with foil. 11. Braise in oven turning meat once, until fork tender 3-3.5 hours. 12. Transfer brisket to a cutting board and slice across the grain. 13. Skim off and discard fat from surface of sauce. Serve sauce spooned over meat. It has been a long time since I’ve been able to get organized to write a post. I have a backlog of recipes that I want to share. But, instead of going back in time… I’ll write up some recipes I used for our Christmas dinner celebration. It was a wonderful feast with good friends, friendly pups, and lots and lots of fabulous food. On the menu was turkey, gravy, stuffing, green beans, risotto with scallops, stuffed onions, stuffed peppers, butternut squash soup, and butternut squash salad (if you can believe it, I think I may be missing menu items!). I brought over cauliflower gratin and veggie lasagna. Both turned out wonderfully! The lasagna is very time consuming, but work every minute! 2. Layer the cauliflower, heavy cream, and the 3 cheeses in a medium casserole dish. 4. Roast for 20 to 30 minutes or until the cauliflower is soft and the sauce has thickened slightly. 5. Remove from the oven and let rest for 10 minutes before serving. Note: This is a complicated recipe. I made the ricotta a day in advance and then worked through the recipe. I organized it by each of its components. 1. Heat oil in heavy pot over moderate heat and add onion, cooking for 6 minutes. 3. Add tomato paste, tomatoes, juice, sugar, salt, and pepper and bring to a boil. 4. Simmer, stirring occasionally, until sauce is thickened, 45 minutes. 5. Stir in basil and remove from heat. 1. Stir together in bowl until combined and refrigerate. 2. Oil two large baking sheets. 3. Arrange eggplant slices on one and zucchini slices on the other. 4. Brush veggies with olive oil and sprinkle with salt and pepper. 5. Bake, turning once, 20 minutes. 1. Heat milk in a small saucepan until warm. 2. Heat oil in heavy saucepan over moderate low heat until hot. 3. Add garlic an cook, 4 minutes (or less). 4. Add flour and cook, whisking, for 2 minutes, to make roux. 5. Add warm milk in a steady stream whisking constantly. 6. Simmer sauce until thick 3-4 minutes. 7. Stir in cheese, spinach, salt and pepper. 1. Oil a 13-9 inch glass baking dish. 2. Spread 2 cups tomato sauce into dish. 3. Cover with lasagna noodle(s). 4. Spread ricotta, then cover with eggplant (overlapping to fit). 5. Top with more lasagna noodle(s). 6. Spread 1 1/2 cup sauce and top with spinach mixture. 7. Top with more lasagna noodle(s). 8. Top with zucchini (overlapping to fit). 9. Top with last of lasagna noodles. 10. Spread remaining sauce and sprinkle top with mozzarella. 11. Cover with well buttered foil and bake for 45 minutes at 375. 12. Remove foil and bake additional 10-15 minutes until lightly browned. 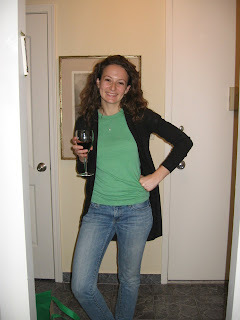 Author AdminPosted on December 27, 2009 June 20, 2012 Categories KitchenTags Holiday Cooking1 Comment on Christmas Dinner! For the Thanksgiving sides we served brussels sprouts, sweet potato casserole, cooked carrots, and cranberry sauce. The cranberry sauce was the best surprise of the meal, since it was my first time making homemade sauce. We usually use the Ocean Spray canned jelly. I was determined to find a sauce that would convert many of my friends and family to a homemade variety. And, it was a success! 2. Put the hazelnuts on a small rimmed baking sheet. 3. Roast in the oven until they are a deep golden-brown (the skins will be visibly splitting), 5 to 6 minutes. 5. Let the nuts cool for about 10 minutes. 6. Finely chop 1/4 cup of the nuts in a small food processor. The nuts should be very finely ground, but not so much that they turn into nut butter. 7. Coarsely chop the remaining nuts and set aside for a garnish. 8. 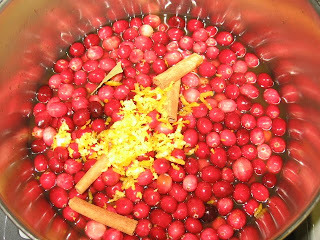 Put the finely chopped nuts, butter, lemon zest, thyme, honey, and 1/4 tsp. salt in a small bowl and mix with a spatula until well combined. 9. Set aside or refrigerate if not using right away. 10. Heat the oil in a 12-inch skillet over medium high heat. 11. Add the Brussels sprouts and 1-1/2 tsp. salt and stir well. 12. 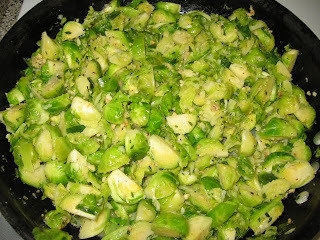 Reduce the heat to medium and cook, stirring occasionally and then more frequently as the sprouts begin to brown, until all of the sprouts are golden-brown on most sides and have lost their raw color (they will still feel firm), 15 to 18 minutes. 13. Add the broth and immediately cover the pan. 14. Cook until the broth has reduced to a few tablespoons, about 2 minutes. 15. Uncover, raise the heat to high, and boil off most of the remaining liquid, 1 to 2 minutes. 16. Take the pan off the heat and add the hazelnut butter in spoonfuls; toss well. Season to taste with salt. 17. 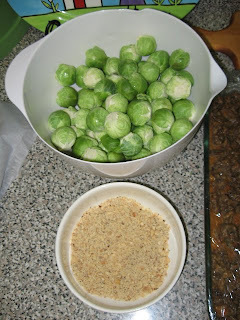 Transfer the sprouts to a warm serving dish and garnish with the reserved hazelnuts. 2. Pour into a buttered 1 1/2 to 2-quart casserole dish. 3. 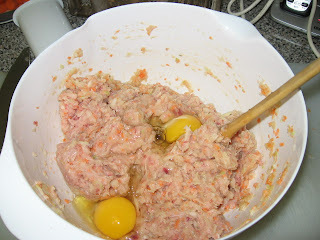 Mix remaining ingredients together and sprinkle over top. 4. Bake at 350° for 30 to 40 minutes, until hot and browned. 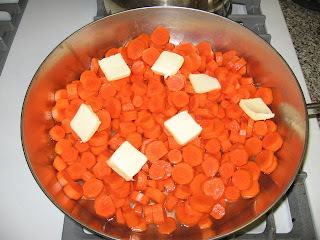 Here is a look at the carrots while they are cooking. I’ll have to get the recipe from my mom to post. Most important of the sides (although they were all delicious), was the cranberry sauce. A happy new addition to our Thanksgiving dinner. 1. Combine all ingredients in heavy large saucepan. 2. Bring to boil over medium heat. 3. Simmer until berries burst and sauce thickens, stirring occasionally, about 15 minutes. I ended up simmering for a bit longer than this to get the right thickness, maybe 20-30 minutes. 4. Remove cinnamon sticks, cloves and bay leaf. Stay tuned for the most important part of the meal, stuffing, turkey, and desserts!